I've been writing haiku since my sixth grade teacher, Mr. Smith, introduced them to me. I generally follow conventions: three lines of 5 syllables, 7 syllables, and a final 5 syllables. Usually there's a seasonal reference, and often I try to make connections between up to three distinct images. But sometimes I break with convention. Last week, I drove from Castle Rock to Saint Paul and back for a memorial service of one of my best friends, Bill Johnston, who died of cancer at 64. The memorial, the loving labor of his wife, Claudia, and 150 of Bill's many friends (he not only never lost a friend, he never even fell out of touch) happened a few days after what would have been his 65th birthday. These poems don't really talk about that. Instead, they were about just being open to the rolling vignettes along national highways. But Bill was also a poet, and a fine one. So this is my tribute to him. It's also worth noting that I left amid dire predictions of Siberian snowstorms, and returned to their aftermath, without ever experiencing anything but cold. "we're cooking up something new:"
Shortly after I got my library degree, I joined the American Library Association (ALA) and went to my first conference. It was, for a young man of my modest means, insanely expensive. I don't mean registration and membership dues, I mean travel, lodging, and meals. I got a little help from my employer, but not much. And ALA was big. It was impossible to catch everything I wanted to, and I spent a lot of time running between things. In retrospect, I think I could have planned better. But at the time, I concluded that ALA activity, particularly involving conferences, was simply out of my reach. So I paid my membership, read the magazines and a couple newsletters, and that was about it. I focused my attention on local, then statewide and regional professional groups. I wound up in leadership positions in many of them (the state chapter's public library division, the state library association presidency), which was terrific experience. I came back to ALA in a big way when two things changed: first, I was further along in my career and had more money; second, I had an issue (ebooks) that urgently required national action. ALA president Molly Raphael appointed me to the Digital Content Working Group (DCWG). I had the pleasure of working with a high level committee dedicated to getting things done. And we did. My experience is neither unusual nor definitive. Not everyone follows the same path of professional involvement. But ALA, finally, is our biggest room, our strongest collective voice. It's where we do, or should, wind up. At midwinter 2015, a lot of ALA members were very worried about declining membership. There are a few bright exceptions: YALSA and ALSC have managed to grow -- reflecting a surge of interest in youth. But to me, the issue isn't really about ALA. It's about that sometimes awkward moment of generational change. Boomers are moving out. Millennials are moving up. There are Gen-Xers in the middle, but despite their many gifts, their birth numbers are less than half of the generations on either side. And what do we know about the Millennials, the next generation of librarians? They are coming into the profession just as a near-Depression wreaked havoc on libraries of all kinds. Many of them accepted less than professional positions, often at less than full time wages or benefits, just to get their feet in the library door. Many of them have staggering student debt. Why is membership falling? Give me a D. Give me a U. Give me an H.
What to do about it? Well, many divisions, committees, and roundtables have already figured it out. We need a continuum of professional engagement. Get info about local meet-ups. Get invited to inexpensive local or regional workshops. Get encouraged to present at them. Get celebrated for your successes. That might be institutional recognition. It might be state association awards. Get introduced to the next level conferences - and on the strength of past presentations, get free registration, or greater institutional support. Get invited to an ever larger sphere of professional activity and engagement. Along the way there are so many free tools to connect people. And being connected is part of what it means to be a Millennial. But I want to underscore something else: it is the duty of leadership (supervisors, department heads, and directors across the board) to invest in professional growth, the essential asset of staff. There are, in fact, best practices of budgeting in this regard, and not just for libraries. How much should an institution spend on a combination of tuition reimbursement, continuing education, and conference expenses? Answer: two percent of the salary budget (exclusive of benefits). That's not an ALA problem. That's the demonstrated need for a professional commitment by our members. Don't look for a national association to solve a profoundly local problem. Step up. Support your staff. And have faith in the rhythms of change. Listening is not waiting for the other person to stop talking. It's paying close attention both to the person and the topic. I'm just back from American Library Association's midwinter 2015 conference. It was in Chicago, which happens to be not so far from where I was born and raised (Waukegan, to the north). I am a candidate for the presidency of the ALA. I met with some 30-odd groups in my time there, as well as speaking with dozens of conference attendees in the halls. My spiel (the 10 second intro) was something like this: "here come my flyers, articulating my background and platform. But I believe that leadership begins with listening. So I won't read to you what you can read for yourself. My question to you is this: what do you want your next ALA president to know about your key issues or initiatives?" And then I shut up. And I listened. It turns out that there are a lot of insightful and articulate people in the association, well worth paying attention to. It's funny and sad how many people tell you that listening is important, but somehow never get around to it. What did they tell me? Next post(s)! I found another wonderful tool for writing, definitely worth sharing. It's called Haroopad. It's an open source, cross-platform, markdown-based, code folding-capable editor. You can download Mac, Windows, and Linux versions from here. The defaults seem to be set up for writers. You can toggle views: editor and HTML viewer side by side, or viewer (on the left) and editor (on the right) if you prefer that orientation, or just one or the other. It has a constant word count display on the bottom status bar. It has lots of themes. There's an automatic focus on the current paragraph. The best thing is code folding. (This is a neat trick that turns a text editor into an outliner. By that, I mean that you can selectively hide and reveal big blocks of text, allowing one to see or rearrange the structure of a document.) I did have to toggle it on (on the Mac, it was under File>Preferences). It works reliably and consistently by structure (header level). I love outliners. Other cool features: full screen editing mode, search, and some markdown enhancements for tables of contents, footnotes, and more. It's easy to bump the font size up or down. It also supports and correctly displays the github syntax for Tasks. Bottom line: you wind up with a small fast, capable environment that allows you to quickly and efficiently generate text for the web. Issues: it exports only to HTML. No spell check. You can work with more than one file at a time, but it's not tabbed (each file is a separate window). There's no navigation by structure. But pretty amazing for free. I actually like this better than either Sublime Text or Brackets. HarooPad weighs in at 108.9 MB in storage. 9.3 MB of memory. It's a find. Today I picked up a pair of re-soled and re-sealed work boots. 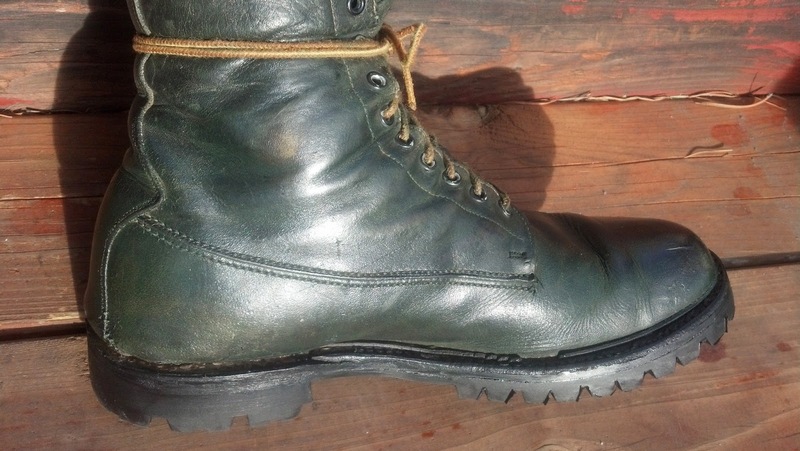 I have worn these boots for an incredible 37 years. I bought them in Bloomington IL, right after college. At the time (1978), I was a truck driver in central Illinois, delivering produce (green goods) through what turned out to be one of the most brutal winters in a century. Later, I wore them through my hitchhiking around the country. Most recently, I find them to be the perfect boots for Rocky Mountain trails. Not to be too sentimental about this, but these boots KNOW my feet. They are molded to my bones. We have known each other longer than I have known almost anybody. They have 10 eyelets, so I suppose are about 8 inches tall -- I only thread seven of the eyelets, then run the laces around the boot for a secure fastening over the ankle. They have a double-lined leather interior. The outside leather is dyed GREEN. The soles (my second ever) are Vibram. These boots were made by Supreme - a company I cannot now locate. I suspect it's because you only ever had to buy one pair of boots, and you were set for life. Possibly this is not the best business plan. There came a time the sole started separating from the last. So I took them in to the local repair shop here in Castle Rock. I don't remember what I paid for them originally. $150 seems about right - which was a huge percentage of my income back then. This refurbishing, 37 years later, cost another $89, which not only preserves the original investment (and fit to my feet), but is way, way cheaper than any of the alternatives I investigated. Boots, boys and girls, really good boots, are a very, very smart investment. And do keep them up (saddle soap, mink oil, polish and polish).